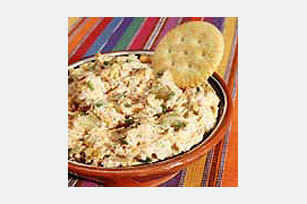 Cream cheese is mixed with a can of deviled ham spread, cheddar cheese, chilies and green onion for a zesty appetizer spread to serve with crackers. Beat all ingredients except crackers in small bowl with electric mixer on medium speed until well blended; cover. Refrigerate at least 1 hour or until chilled. Serve as a spread with crackers. When eating appetizers at a social occasion, be mindful of what you are eating. Savor the taste and eat slowly so that you are satisfited with just 1 serving. Prepare as directed, using your favorite variety of KRAFT Shredded Cheese.